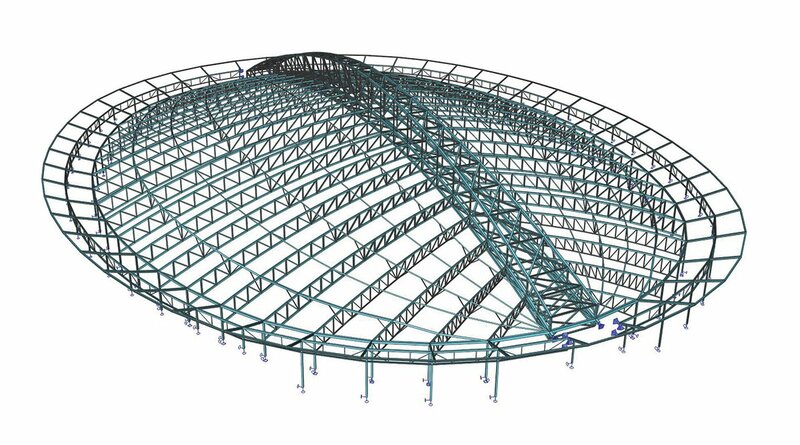 The arena roof is part of the King Saud University Sport Campus in Riyadh (Saudi Arabia) and it is the main feature of the sport campus. The building is for indoor athletics and also has the ability to hold conferences. The basic form of this building consists of a large single span roof with a central arch truss supporting secondary trusses. The steel structure covers an independently stabilised reinforced concrete frame. 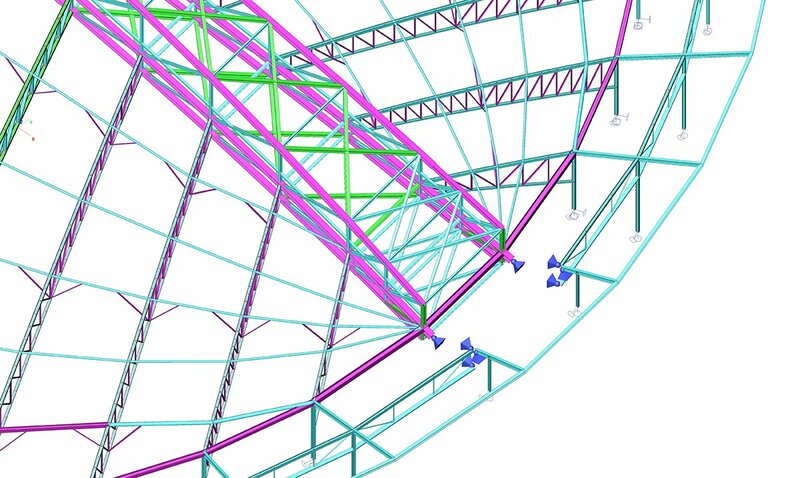 A steel arched truss with cords in HISTAR profiles spanning 145 m between reinforced concrete buttresses. Buttresses are formed from a series of interconnecting shear walls with a thrust block above and thick foundation below to underlying rock. Secondary arched trusses supported by the main truss and parametrical columns. A perimeter flat ring connected to the end of the arched truss and to the concrete buttress. 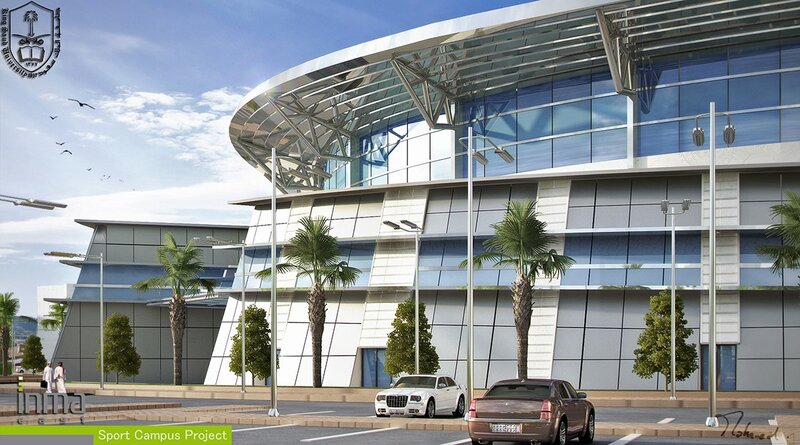 The roof cladding is a light-weight complex with steel sheets, insulation and water-tightness. The roof bracing has been divided into two parts in order to avoid lock-in stresses. The overall stability is provided mainly by the buttresses. The main arch transfers the lateral loads back to the buttresses through a combination of axial thrust, minor axis and major axis bending and torsion. The external part of the perimeter ring floats over the concrete structure via pin-ended columns with free displacement support made with Teflon. Vertical loads from the main arch truss are transferred back to the buttresses via axial thrust and major axis bending. Vertical loads acting on the perimeter ring are transferred to the reinforced concrete structure via axial loads in the parametrical columns. The model geometry was imported from a dxf file provided by the client. The beams, hinges, support and loads were then introduced. The layers manager was really useful in this project for analysing the project part by part. 3D exportation in dxf and pdf was used for transmitting the sketch of the results, as column displacement and reactions. The predefined load library allowed for a quick introduction of the loads. The wind loads curve tool was used to model the evolution of the wind pressure all along the height of the building. For the analysis of the behaviour of the structure, we used the deformed structure results. In fact, by using a relative big scale factor, this tool shows how the structure deflects and allows for locating the critical points and also detecting if there is a non-symmetry (the model is double symmetric, so its behaviour should also be symmetric). The very large document possibilities allowed for the production of the calculation sheet and transmission of information between the project actors.